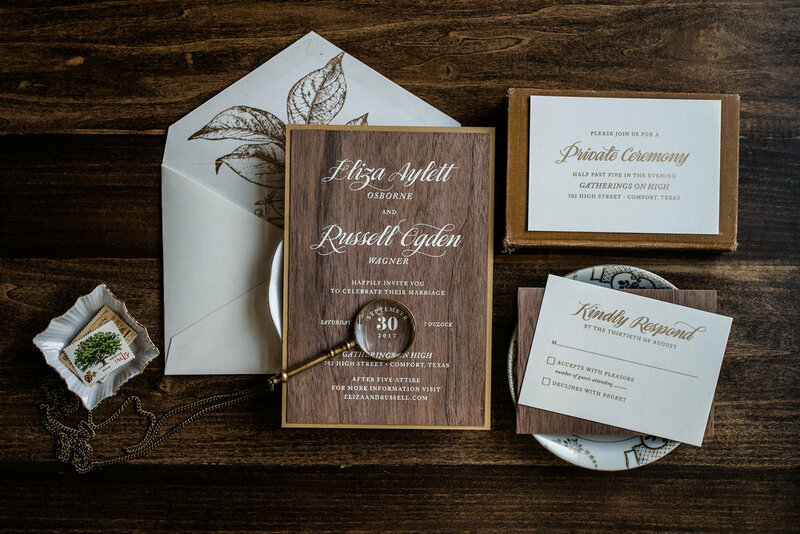 These invitations are printed on genuine walnut wood, making each one truly one-of-a-kind. Complemented by a beautiful leaf design printed in gold ink on the inside of the mailer envelope and elegant fonts - creating a unique yet classic invitation design. Our starting prices for invitations are approximately $1,750+, while the average Penn & Paperie client typically spends $2,000+. These are rough figures based on a quantity of 100. To receive a custom quote, please fill out an enquiry form by clicking the button below that says "inquire about this product". Our starting prices for invitations are approximately $1,750+, while the average Penn & Paperie client typically spends $2,000+. These are rough figures based on a quantity of 100. There are a range of factors that can affect the pricing for invitations - like printing options, cardstocks, and the amount of enclosure cards. Knowing your budget helps us narrow down what options would work best for your project.